There are many people out there, myself included), who think to themselves “I have so much experience to share with the world in (insert career field of choice). Maybe I should write a book!” And then would come the inevitable, “Nah. No one would read it.” I’ve thought those things many times. When reading articles and books about writing there is one thing that always seems to come up: write what you know. If you know a lot about gardening and plants, write about that. If skiing is your thing, write about that. The trouble with this advice is the “No one would read it” thought that unavoidably enters the mind when contemplating such a task. Take me for example. I know a lot about a lot of things, but if I were to write a book it would probably be about movies, since I’m a critic. The problem with that is that if I were to write a book about movies, it would no doubt come out VERY boring! Who on earth would like to read a book that is 100 plus pages of films I like or dislike? I know I wouldn’t, and so I don’t even begin to attempt it. One person who has overcome such obstacles is the filmmaker and owner behind the production company Stories in Motion, Chris Esper. 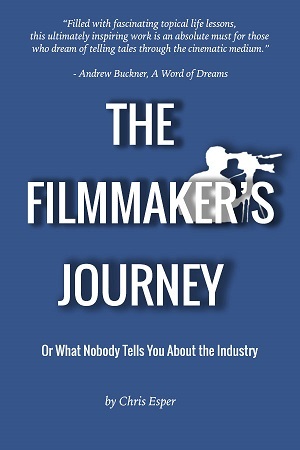 Chris can add the title of author to his resume now that his debut book, The Filmmaker’s Journey or What Nobody Tells You about the Industry, has been released. It is in the personal stories that Chris relates in the book that you find the real meat and potatoes of it all. In one such example he details a nightmarish client he once had. He explains how, no matter what he did, the client wasn’t happy with the video he made for him, and how, in the end, Chris ended up putting far more effort and work into the video than he should have. In reflecting upon the story, Chris realizes that, in that instance, he should’ve been clearer in the contract he made with the client and perhaps have cut ties with the client before putting in as much effort as he did to make this person happy. He explains all of this in order to make a couple of points to the reader: 1) that anyone making a contract should try to be sure it’s air tight and clear, and 2) that sometimes there’s no pleasing a person, and it may be better to just walk away. In another instance, Chris describes how he showed one of his films to a critic, in hopes of gaining a good review. Unfortunately, this critic didn’t like the film at all, and let Chris know that. Rather than lashing out at this critic and being upset, Chris reached out to him to thank him for his time, and to ask if he’d be interested in seeing what else Chris had to offer. The critic was impressed with Chris in this instance and made it known on his Facebook page. The point here is that one should always try to be amicable and professional, even in the most difficult circumstances. While there are plenty of things in life that can only be learned through experience, Chris’s hope is that people will learn from his experiences, so that they may have an easier time of it, and not make the same mistakes he has. The resources he’s included in the back of the book are invaluable to filmmakers and non-filmmakers alike. The Filmmaker’s Journey is a gem of a little book that you’ll come back to over and over again, both for the advice, and for the resources. If more people had the courage to do what Chris did, and write a book about what they know, there’d be FAR fewer mistakes made in the world!